New Zealand turned the tables on 2016 Olympic champions Australia, winning a thrilling final at Robina Stadium on the Gold Coast in extra time. It was the first time women’s rugby sevens had been contested at the Commonwealth Games. Women’s sevens is a relatively new sport at the international level. A three-tournament IRB Women’s Sevens Challenge Cup series was held in 2011/12. Since 2012/13 a World Rugby Sevens Series of between four and six tournaments has been contested each season, with the Black Ferns Sevens winning four series. Australia’s 24–17 victory in the Olympic final at Rio de Janeiro was galling for New Zealanders who had become accustomed to beating their trans-Tasman rivals. The omens for the Gold Coast were not propitious, with the Australians winning the first two tournaments of the 2017/18 world series and a New Zealand player hospitalised with the mumps the week before the Commonwealth Games. New Zealand and Australia duly won their pool matches and semi-finals. 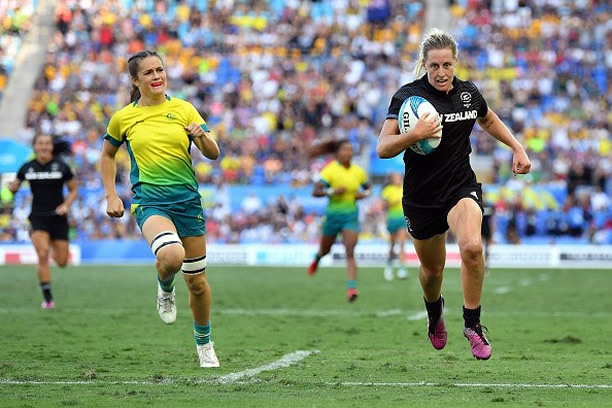 In the final the Black Ferns Sevens scored two tries to lead 12–0 at halftime, but the Australians responded in kind to send the match to sudden-death extra time. Australian Vani Pelite seemed certain to score the winning try but was tackled 5-m from the line. When the Australians were penalised moments later, Kelly Brazier took a quick tap and sprinted 80-m to win the game. We have 25 biographies, 9 articles, related to Black Ferns Sevens win Commonwealth gold.